The innovative Keencut Evolution E2 is an integrated wide format cutting system that was designed to revolutionize the speed, accuracy, and convenience of the finishing process in the print and sign making world. Intended to fit any work bench, or to be mounted onto the E2 workbench, the all new Evolution Cutter shares the same outstanding 1:15,000 straightness accuracy guarantee of the world renowned Javelin Xtra cutter bar. The unique four piece cutter slide-way and torsion bar extrusion, combined with the all new full length base plate to create a cutting machine that will meet the challenges of the most demanding operator and enhance valuable artwork. The integral lift and hold mechanism of the new Evolution cutter, operable from either end, ensures consistent straightness even under flex, while the swing-over and under-bench stowaway facility provides maximum working convenience and space efficiency. The built-in textile cutting track and textile cutting attachment (which is included) add the final refinements to the most versatile, accurate and simple to use wide format cutting system ever. Available in several different cutting lengths, the Keencut Evolution E2 rotary trimmer has been created to handle the output of every size and type of roll feed or flatbed printer with the capability to cut materials as diverse as flag, banner, card, PVC foamboard, foamcore, and much more. 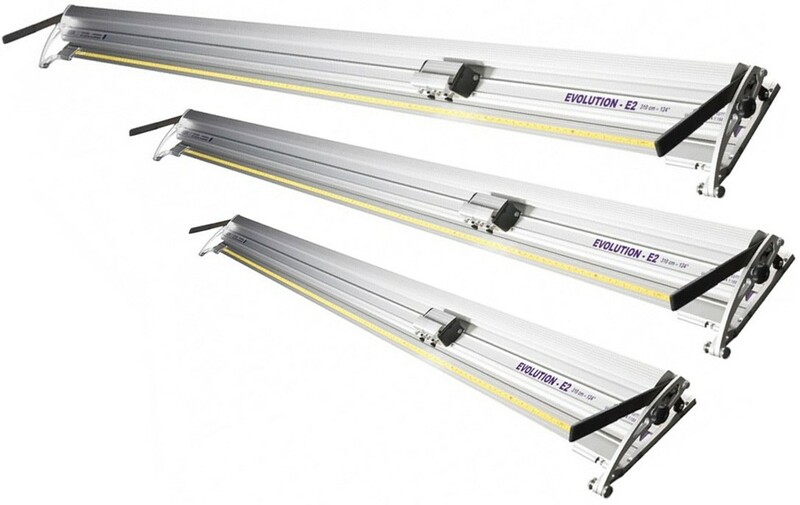 The Keencut Evolution E2 Trimmer is available in 5 convenient sizes including 64”, 84”, 104”, 124”, and 144” cutting lengths. All models have a cutting capacity of up to ½" thick material, and will cut through a variety of products including paper, tissue, laminate, fabric, banners, 10mm foam board, 6mm acrylic or Plexiglas, and more. There are a variety of blades available for different items, including superior blades, medium duty blades, XR blades, scoring blades, a textile cutter, and more. We are so confident in the Foster Keencut Evolution Cutter that it comes standard with a 5 year manufacturer’s warranty, which is virtually unheard of for equipment in the printing industry. The Keencut Evolution rotary trimmers are the most complete, accurate, and user friendly manual multi-purpose cutters ever built for the sign and digital market!